Class that holds static functions for handling compound queries. This class inherits from Semantic MediaWiki's QueryProcessor. Comparison helper function, used in sorting results. Handler for the #compound_query parser function. 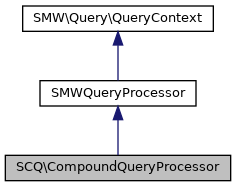 Matches getResultFromQueryResult() from SMWQueryProcessor, except that formats of type 'debug' and 'count' aren't handled. Query and merge results of subqueries.